The weekend travelogue continues. 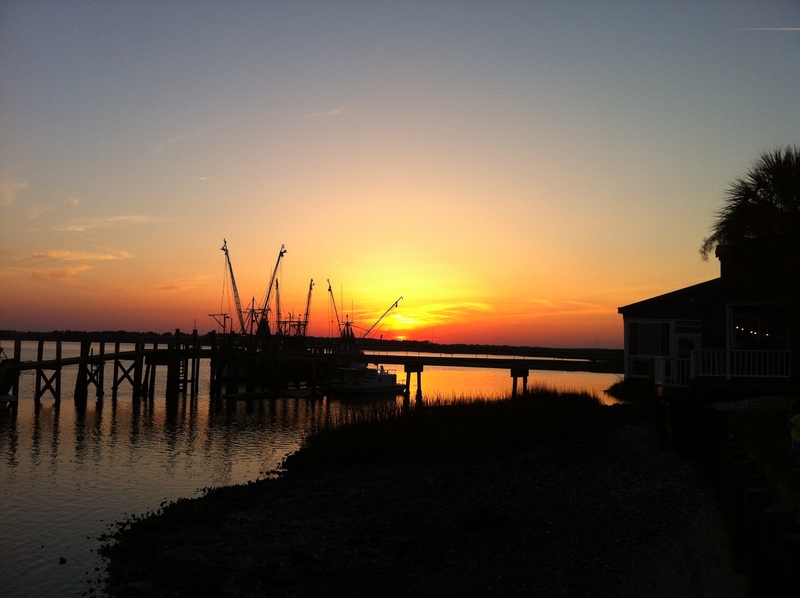 We checked into the Holiday Inn in Beaufort and were really impressed with the lodging. The only minus was the lack of a continental breakfast, something that used to be considered a frill and is now looked on as an expectation. Still, the room was clean and pretty…loved the marble bathroom floor. 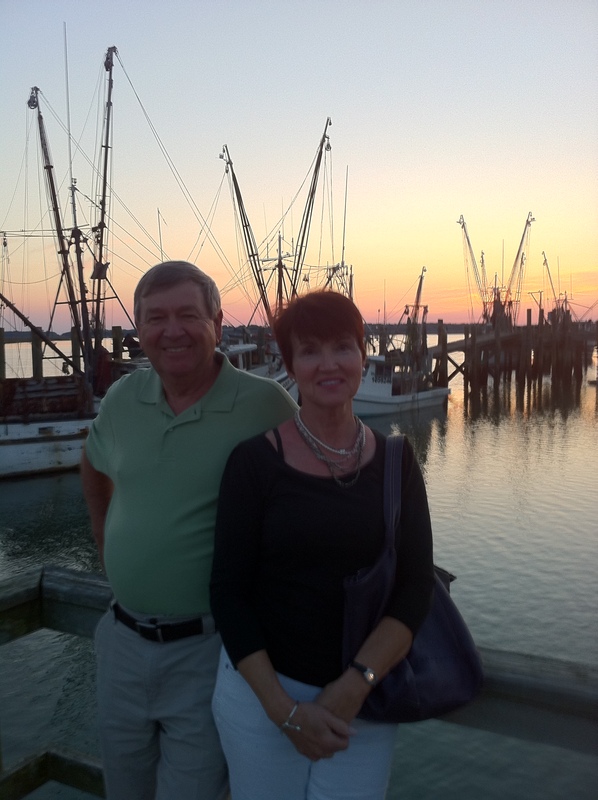 On the recommendation of the staff at the Holiday Inn, we went to the Dockside in Port Royal for dinner. 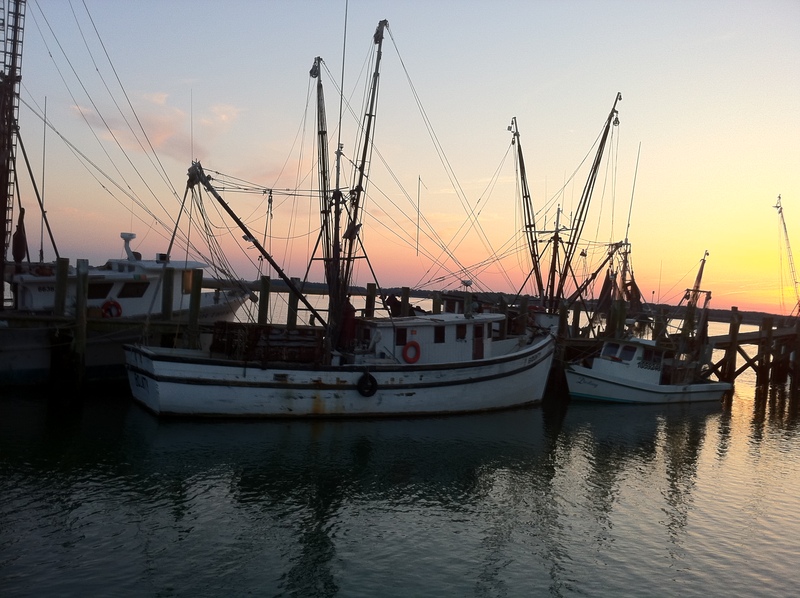 A little off the beaten path, the restaurant is on the water and provides a magnificent view of the harbor and the shrimp boats. We arrived right at sunset, and I took several photos of the beautiful setting sun and the surrounding area. During our wait, we chatted with a couple from Kentucky, and I enjoyed listening to their travel agenda for the next several days. I also enjoyed extolling the virtues of Savannah…love that place! I volunteered to take their picture, and they returned the favor. The meal at Dockside was superb! We loved the ambience of the restaurant, the friendliness of the wait staff, and the scrumptiousness of the food. The prices weren’t that bad either. Truly, I’ve seen higher prices in other seafood establishments whose food can’t compare in taste, variety, or quality. The next morning we headed out of Beaufort towards Hunting Island State Park and stopped for breakfast at the local Huddle House. What a microcosm of Americana! A HH diner can always expect to be among the high and the low, the rich and the poor. On this particular morning, the noise level was deafening, and we soon determined the reason for it: two men trying to outdo each other with their stories. Finally one of them, the one dressed in his Sunday duds, got up to pay his bill, and we sighed a sigh of relief. “He can’t talk to himself,” reasoned my husband about the gent who was still sipping his coffee. WRONG! Not only did he talk to himself, but he also crooned a few melodies, and after a few moments we sort of succumbed to the situation and began enjoying the music. I also enjoyed seeing several mother/child combos sharing waffles bacon together. Breakfast behind us, we drove to Hunting Island State Park, and I loved loved loved loved the scenery along the highway. So green and tropical. At last we went over a very narrow bridge, and within moments we were at the entrance of the park. 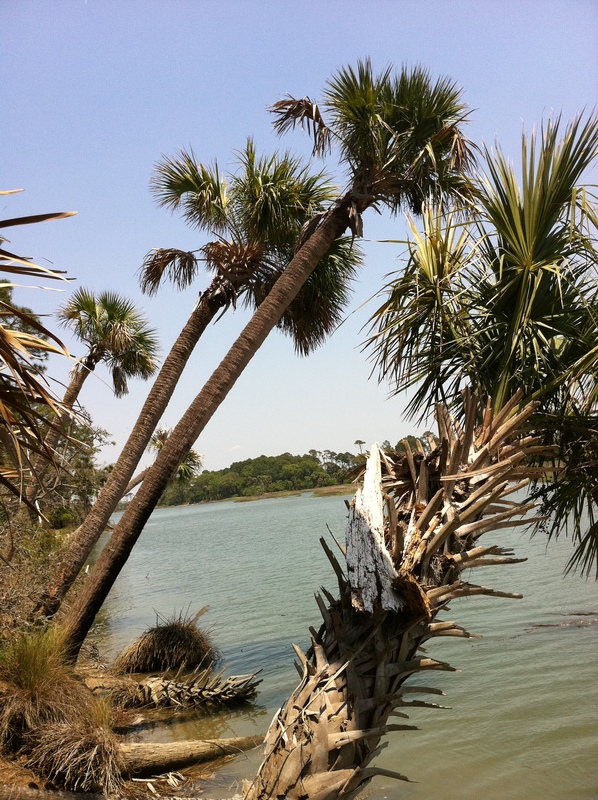 Ever since seeing a documentary on Hunting Island, I’d wanted to visit it, and we were both excited to finally be there. Once inside the park, we first visited the beach. It was awesome! 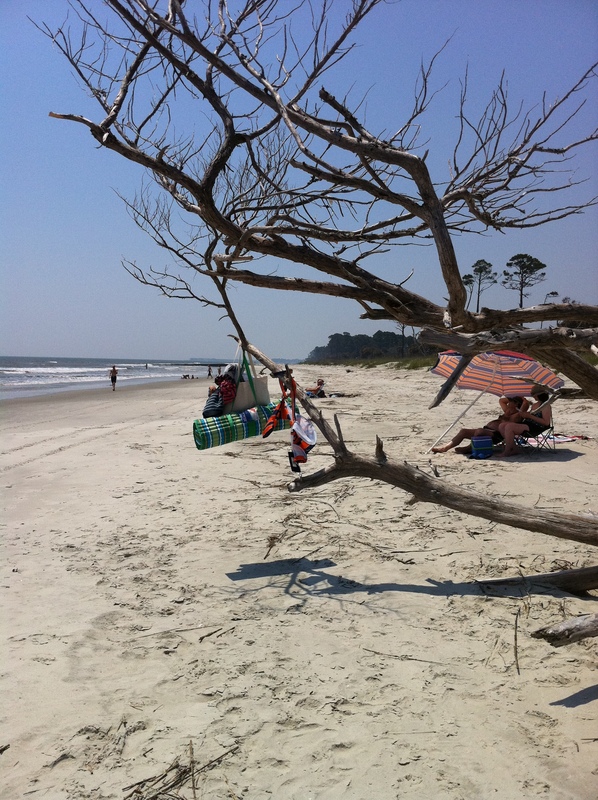 The beach was wide, the sand was white, and there were numerous dead tree limbs and trunks. People used the latter for hanging their bags, clothes, and other personal belongings. A few of the smaller limbs were decorated with shells. I loved it so much that not even the dozens of dead jellyfish dampened my mood. After leaving the beach itself, we walked a 1.4 mile trail through the maritime forest. 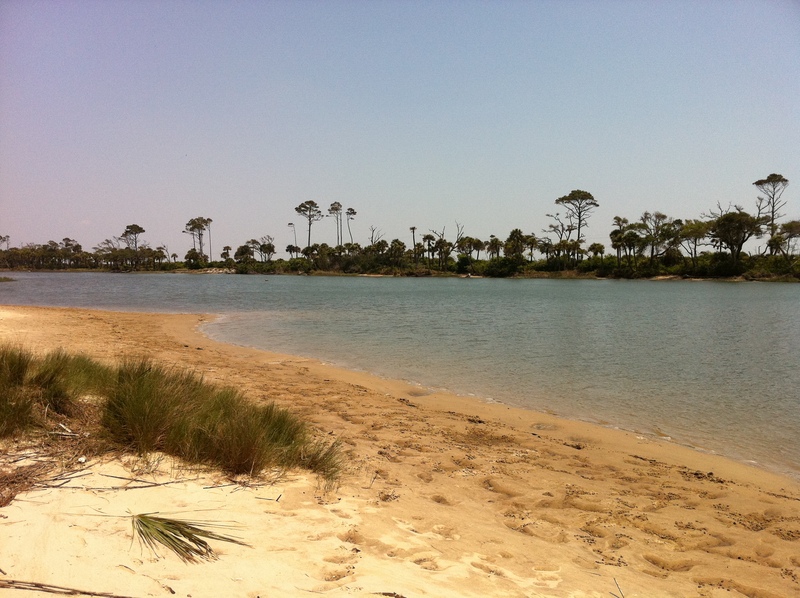 The forest was on our right, and a lagoon was on our left. We were in heaven…or I was. I took picture after picture with my iPhone so that I could relive those moments in the months and years to come. Although we were beginning to tire a bit, we couldn’t leave the park without visiting the lighthouse. I had read about it at the visitor’s center and wanted to see this special landmark “up close and personal.” In fact, I decided to climb to the top, and I’m so glad I did because the views were spectacular. A young girl who was struggling for breath ran past me and declared that she was trying to beat the girls’ record of 15 times up and down in two hours. The boys’ record was 17 times. When I descended, she was still huffing and puffing. Hope she made a new record. My hubby and I then decided to sit in the shade and eat a huge chocolate ice cream cone. It was divine, both the refreshment and the relaxing experience. Before leaving, we walked down once more to the beach. He says if you’ve seen one beach, you’ve seen them all. I say, “No way, Jose.” They’re all different, and the one at Hunting Island State Park is one of the most unique I’ve seen yet. My friend Christy is looking for the perfect spot for a special weekend getaway. I hope I’ve convinced her to visit Beaufort, Port Royal, and Hunting Island. I know I’ll be back. It’s amazing what a payoff can come from proper pacing and a little positive self-talk. 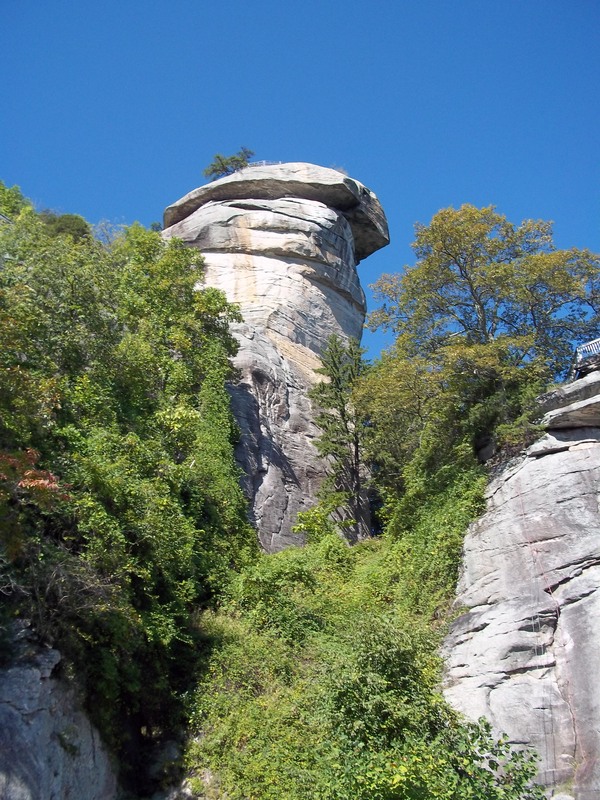 About Chimney Rock, it’s an awesome place. I’ve been there several times in my life, but it wasn’t until two years ago that I actually went to the top of the rock. 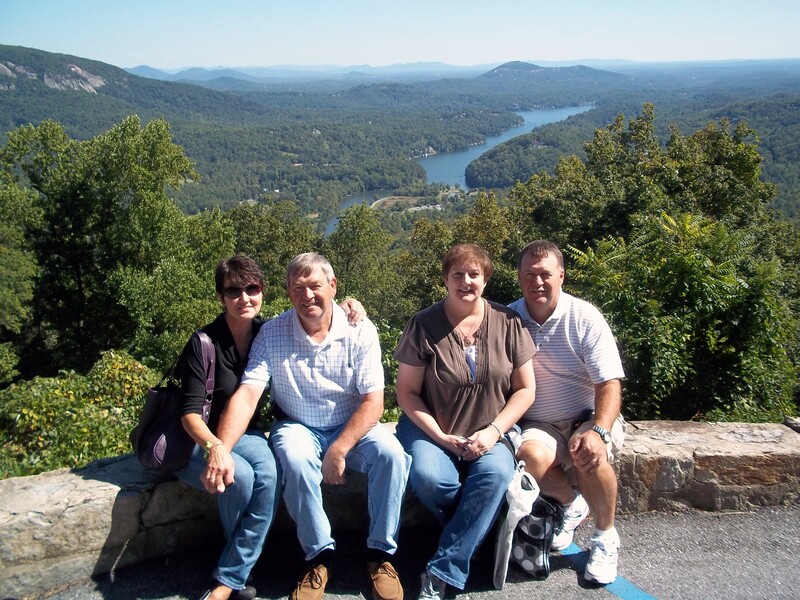 That day we rode the elevator, and later we walked a trail at Hickory Nut Gorge. The waterfall was beautiful, just like everything else around us. Last week when we visited Chimney Rock again, I was determined to walk the steps to the top. “You’re crazy,” my husband declared. “Yes, I already know that. See you at the top,” I said. “And don’t worry. If I feel like I can’t make it, I’ll turn around and get on the elevator.” He shook his head, probably wondering at my sanity (or lack thereof) and walked away. Folks, it was quite a workout. I could feel AND hear my heart beating. Instead of being deterred by it, I tried to think of how magnificent an organ the heart is and how fortunate I was that mine seemed to be working so well. I met several people along the way up, among them a couple of young couples that I passed (loved that!). Okay, to be honest, one of the couples stopped to take pictures of each other posing along the trail, so naturally that slowed them down. I volunteered to take a shot of them together, and they were appreciative of that. Hope they like the way the picture turned out. Heart working overtime, I paused to take some gorgeous pictures of the trees and birds and trail itself. “A step at a time, Jayne. Just a step at a time. You can do it!” It’s amazing what proper pacing and a little positive self-talk can do. I also thought of something I learned from teaching Human Growth and Development: What most people in later adulthood say they regret are the things they did not do, not the things they did and failed at but the lost opportunities, the phone call never made, the hill never climbed, the trip never taken, the dance not danced, and the song unsung. When I’m in one of my children’s homes living out my last days (since none of them ever read my blog, it’s safe to say that), I won’t be saying, “If only….” It’ll be too late then to even get in the elevator at Chimney Rock, much less climb the stairway. Before we got on the elevator (I succumbed to the not so subtle pressure of my sweet husband), we walked outside once again, and an employee of the park asked us if we wanted him to take our picture. “That’s part of my job,” he assured us. “Making sure everyone has a good time,” he said. We did. And you will too. 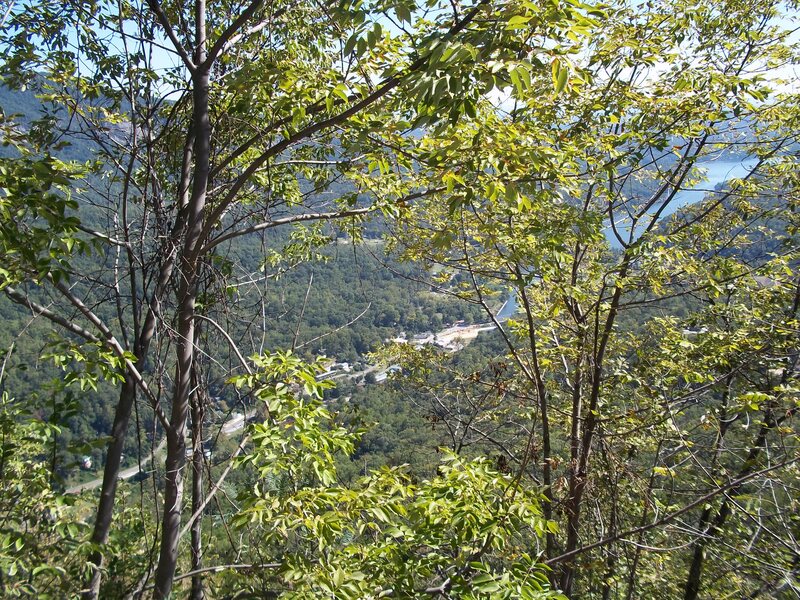 Put Chimney Rock on your “to do” list this year. Even if you don’t make the trip to the top, the town itself is charming, especially now that the river walk has been added. And don’t even get me started aabout the quaint gift shops, restaurants, and streetscape.